NorthBay Healthcare Foundation recently received a bequest from one of its long-time supporters, and the funds will be used to support NorthBay Alzheimer Services and the Adult Day Center. The bequest came from Oretta Cortland of Vacaville, who for years had generously volunteered her time to the NorthBay Guild. She worked in the gift shop, on the hospital floor and in the NorthBay Alzheimer’s Resource Center. She also served as president and vice president of the NorthBay Guild, believing it was important for people to give of their time, friends say. 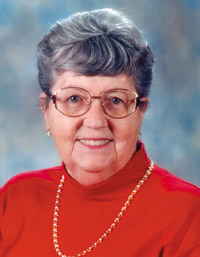 Oretta passed away in December 2009, but because she took out a life insurance policy and named the NorthBay Alzheimer’s Program as the beneficiary, both that program and the NorthBay Adult Day Center will continue to benefit from her generosity for years to come. The gift of more than $20,000 came as an extremely welcome and unexpected surprise. The Adult Day Center does receive some federal grant money but, because of restrictions, they are considered emergency funds and only available to families for a 90-day window of time, Perez says. “It’s a caregiver grant and is meant to help families temporarily until they can figure out the best plan of care for their loved one.” The center also receives donations from private citizens and participant fees. Perez used some of the funds from Oretta’s estate to provide scholarships for her financially strapped families. She used the balance to build a shade structure to cover the center’s back patio, making it a more comfortable place for her clients to spend part of their day. Her clients and their families will reap the benefits of Oretta Cortland’s generosity for years to come, Perez adds. For more information about the NorthBay Adult Day Center, call (707) 624-7970. For more information about how you can leave a legacy through charitable planned giving, contact Johnson at (707) 646-3130.